Natural light poured into the serene, bouquet-adorned foyer of the Weaver Domestic Violence Center on a recent Wednesday morning. With its reception desk, comfy chairs and cushy couches, the vibe was more cozy hotel lobby than domestic violence shelter. But a domestic violence shelter is exactly what the Weaver Center is. Operated by YWCA Nashville & Middle Tennessee, the 51-room shelter is the largest of its kind in the state. Women in crisis and their children come to the Weaver Center to escape from unsafe situations, but the shelter is more than just an escape. It is a fully-staffed, resource-rich haven where women and children get not just four walls and a roof above their heads, but access to services to help them deal with their trauma and prepare for futures free from abuse. In that way, the Weaver Center is much different than the types of shelters many people may be familiar with. The disconnect between the word shelter and the work that the Weaver Center actually does is fitting for an organization, the YWCA, that often gets mistaken for a fitness center. Contrary to that popular misconception, though, the YWCA has been at the forefront of domestic violence advocacy for decades. And, since the Weaver Center opened in 2000, the number of families that the YWCA has been able to help has greatly expanded. In fiscal year 2017 alone, the Weaver Center served 271 adults and 197 children, providing them with a combined 16,664 nights of safety and security. During that same period, the Weaver Center’s crisis hotline answered over 6,200 calls. While that is a lot of help, it is put into perspective by the sheer scope of the problem. For instance, in 2015, the Metro Nashville Police Department received 26,745 reports of domestic violence. That is roughly one report every 20 minutes. For this reason, the YWCA is currently looking to expand the Weaver Center to 65 beds. Last year, Christan Lyons and her three kids occupied several of the beds at the Weaver Center. Lyons found out about the shelter in a letter from the Metro Police Department’s Domestic Violence Division. The letter included a phone number for the YWCA crisis line that women could call if they needed a safe place to go. Lyons had obtained several orders of protection against her abuser in the past and decided it was time to call. The call led her to the Weaver Center. There, Lyons went through the customary intake process, which included a needs assessment and a meeting with an individual case manager who helped to ensure that the experience at the shelter was as beneficial to the family as possible. “When a mom and her children come to our shelter they’re not just kind of dumped there, we have wraparound services available to them,” Johnson said. That includes basic necessities like food and water, but also an array of specifically designed programs. She also utilized resources aimed at helping her find gainful employment after she left the Weaver Center. Lyons had to quit her job in order to flee her abuser and enter the shelter. “There were so many different programs in place at the facility right at my fingertips to get through the process,” she said. Those programs are essential to the mission of the Weaver Center, as Kristi Steel, YWCA Nashville & Middle Tennessee’s senior director of domestic violence services, explained. Stays at the Weaver Center are limited to 45 days, although some women can then move onto the YWCA’s transitional housing program, as Lyons did. The temporary nature of the program puts an emphasis on empowering women to thrive after they leave. The combination of programs and services aided Lyons in answering that question. In early June, she completed a week of training for her job as a certified peer support specialist. While much of what the Weaver Center does is focused on helping women regain their independence, a lot of attention is paid to ensuring the safety and welfare of their kids as well. For one thing, the center provides childcare services while the women attend different classes and programs. “If I didn’t have the childcare I wouldn’t have been able to participate,” Lyons said. More than that, though, the YWCA strives to make children’s time at the Weaver Center beneficial to them. One way they do that is by attending to the kids’ psychological well-being. “We really try to help children get the language they need to process the trauma they’ve been exposed to,” Steel said. Kids are often the fallout in situations of domestic violence. Even if they themselves are not abused, simply being around abuse can have deleterious effects. For example, studies show that witnessing domestic violence as a youth can impair cognitive development and lead to higher rates of drug abuse, depression and suicide. Youths who witness domestic violence may also have a higher propensity to one day become abusers themselves. Therapists at the Weaver Center will do things like engage in role play with children to teach them what to say if, for instance, a friend from their neighborhood asks where they’ve been lately. Kids can also attend programs like art therapy sessions. These kinds of exercises can help children work through their trauma. Additionally, case managers and therapists will work with a family to determine what makes the best sense for kids as far as school is concerned. Would a child be better off attending a new school near the Weaver Center? It not, the center helps to arrange safe pickup and drop-off locations for kids attending their old schools. Another way that the Weaver Center benefits kids is by simply letting them have a good time. A recent Wednesday visit to the Weaver Center’s undisclosed location reverberated with the sounds of high-pitched laughter and happy shouts from the center’s outdoor playground. The running, swinging and sliding kids were playing as part of the shelter’s summer camp program, which is administered by two licensed counselors. Johnson said that the presence of happy kids has a secondary advantage as well. 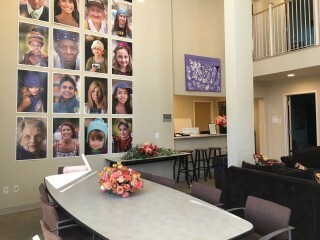 Families at the Weaver Center generally get their own rooms to stay in, while individual women are paired up in double suites. It’s hardly the Hilton, but it’s a far cry from a gymnasium floor stocked with cots. It’s more like a typical college dormitory, with communal kitchens, a TV room and a playroom for kids. Case managers and therapists have offices in the shelter itself, so that residents do not have to worry about traveling to meetings. Multiple people are always onsite to staff the crisis line as well. “In the middle of the night if you need someone to talk to you have 24/7 support where you can go down and talk to someone in the moment about what is going on,” Steel said. Several factors have led to an increase in demand at the Weaver Center in recent years. One important factor is the Metro Nashville Police Department’s implementation of a new program to help officers identify domestic violence victims who are at the highest risk of being seriously injured or killed. The Lethality Assessment Protocol consists of a series of 11 questions that officers ask alleged victims at the scene of a domestic violence call, if the officer believes that a victim is in danger. Steel said that Metro police filled out more than 7,000 LAP forms in 2017. “That has definitely increased our call volume because we’re getting to people in real time when the officers are already out there,” Steel said. Another cause of the uptick in demand has to do with the YWCA’s consistent search for partner organizations and individuals to spread the word about its services. “It’s very important for us to be very connected into the community,” Steel said. The YWCA works especially closely with the Jean Crowe Advocacy Center, which was established by the Metropolitan Government of Nashville and Davidson County’s Office of Family Safety. The Jean Crowe Advocacy Center provides numerous services to victims of domestic violence who are navigating the court system. Many of these victims are in particularly vulnerable positions when they first contact the YWCA. Studies demonstrate that victims are most at risk of violence when they attempt to take action and leave their abusers. These vulnerabilities are on display in Tennessee courtrooms day after day, as victims muster up the courage to confront their abuse. “Just standing there to tell your story in court can be traumatizing,” Steel said. 11th District Circuit Court Judge J.B. Bennett agreed. In a recent story about two domestic violence-related bills passed by the Tennessee General Assembly he spoke about the victims he regularly sees from the bench. Many women may have contemplated leaving their abusers for years, but have been held back by any number of factors. It is not uncommon, for instance, for an abuser to be the main source of income in a household. In those cases, a woman leaving a household either by herself or with her kids steps out into a financial black hole. This is a primary reason why domestic violence is one of the leading causes of homelessness for women. In other cases, emotional entanglements can keep victims from leaving abusive situations. Of course, many times the threat of violence is the primary hindrance to women seeking help. Unfortunately, a fear of violence is not without reason. According to a 2015 study, Tennessee ranks fourth in the nation in its rate of women killed by men. One has to look no farther than the news headlines for corroboration. A June 7 article from WSMV TV pointed out that three murder suicides had just occurred in Middle Tennessee in less than a month this year. Sadly, another suspected domestic murder suicide occurred just days after that article’s publication. The threat is real, the obstacles are real, but so, too, are the institutions and people devoted to assisting victims of domestic violence. For its part, the YWCA wants to “break the silence of domestic violence” and help as many victims as possible take the steps necessary to get out of abusive relationships. A stay at the Weaver Domestic Violence Center is one of those steps for many women. It certainly was for Lyons, who managed to forge a new path forward for herself and her three kids.